Viewing only articles categorized with "Sea Eagles". Breaking down structured defensive lines has never been so difficult, so you can understand why the Sea Eagles are so happy to have a guy like Martin Taupau at their disposal. Jake T: Honoured by award naming. The Manly Warringah Sea Eagles held their annual Junior Representative Awards last night at Club 47, Lottoland. Sea Eagles centre Brian Kelly has been praised for a nice act of kindness in Gunnedah. In the lead up to the final City-Country match in Mudgee, Kelly and some of the Indigenous NRL players visited Winanga-Li Aboriginal Child and Family Centre, where Brian met seven-year-old Cooper. Manly prop Brenton Lawrence covets a Queensland Origin jersey so much it must just land him in the dog house. 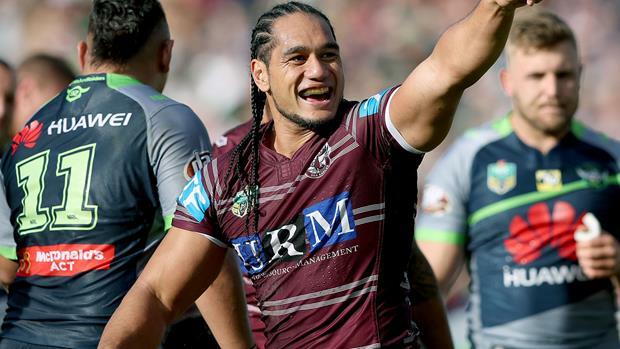 New Zealand forward Martin Taupau hopes strong form for Manly in the No.10 jersey is enough to convince Kiwis coach David Kidwell he deserves a starting birth against the Kangaroos on Friday night. "[Daly Cherry-Evans] had complete confidence in me and just said, 'knock it over'. DALY Cherry-Evans laughed at the media this week but it was his football that spoke the loudest to put a full stop on a tumultuous week for Manly. THEY formed one of the NRL’s most lethal scrumbase combinations and now new Sea Eagles five-eighth Blake Green faces the challenge of winning without his former Melbourne Storm team mate Cooper Cronk. FRANK Winterstein travels 200km just to train. 2019 Rumoured and confirmed signings (NON-DISCUSSION THREAD). Who is our best ever half?